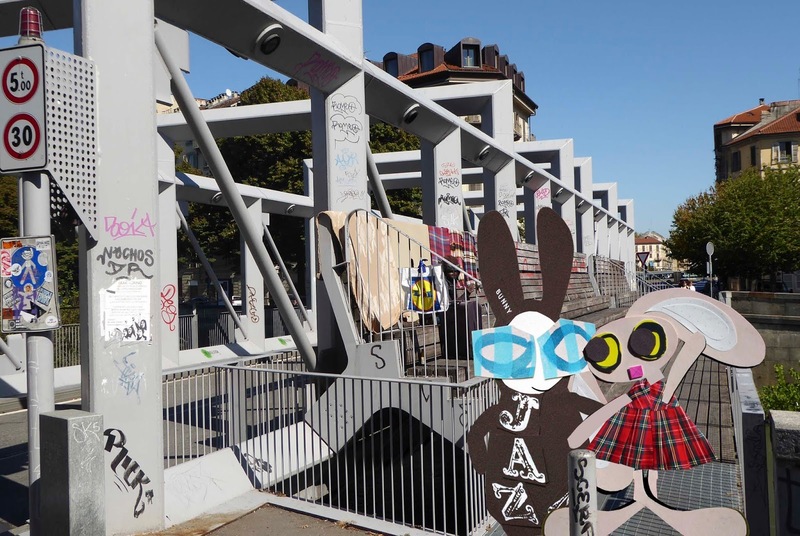 The Wabbit's hop down the river was a formal affair that involved crossing a suitable bridge, then continuing on the other side to the next bridge, then crossing again. They hopped some distance, crossing many bridges until they reached the big University. There, the river became wild and inhospitable and it coursed down to the Po like it was late. The Wabbit studied the graffiti. "Who are the Sons of Anarchy?" Lapinette knew all about it. "It's a crime soaper on cable TV about a motorbike gang." "Now I remember," said the Wabbit; "Hamlet and Harleys." Lapinette glanced down. A rose lay on the parapet and she picked it up. "This is the rose Jenny wears on her pirate hat." "Are you certain it's hers?" said the Wabbit; "They all look alike." Lapinette peered into the swirl of water. "Well, there's her hat!" The Wabbit's fur stood on end and he jumped to dive into the river. "There's no-one, Wabbit. I can't see her," yelled Lapinette. They both raced to the other side of the bridge but they could see only river and woods. The water roared by with a deafening growl but there was no mistaking the bark of an automatic. "Jenny," breathed Lapinette. 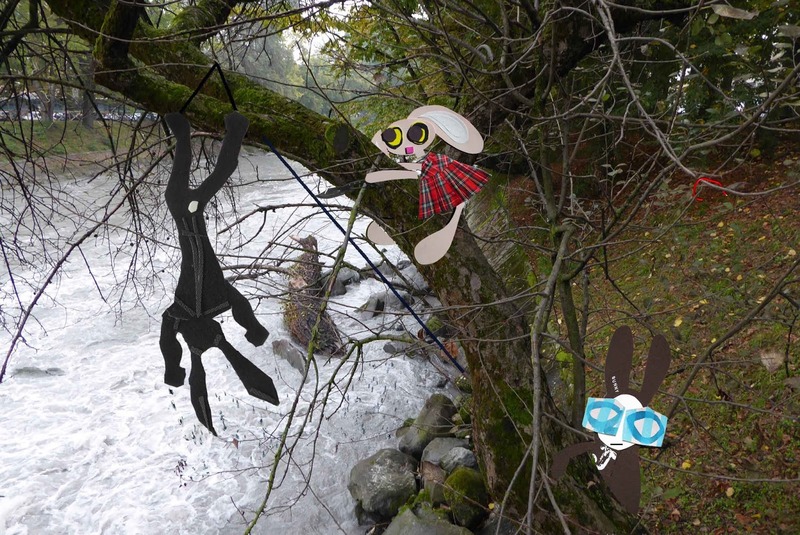 The Wabbit indicated a point farther down the river. A muzzle flash lit the water and a bullet hit a tree. Branches cracked and birds lifted. 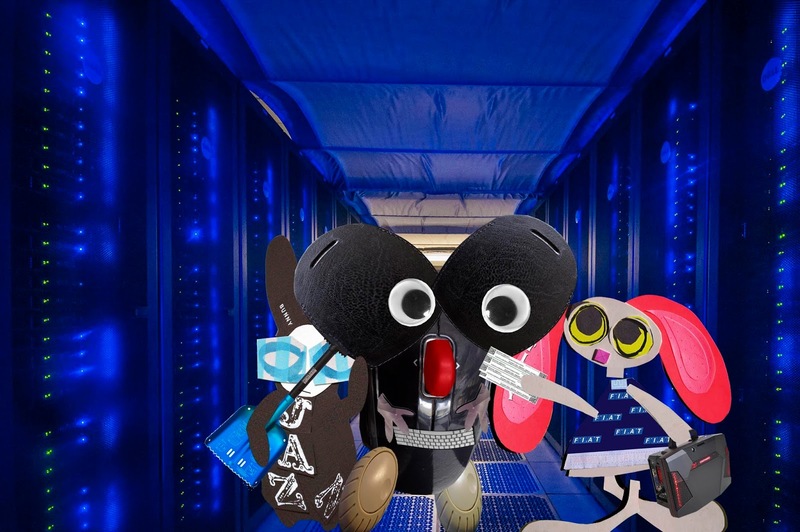 "Let's join the party," said the Wabbit. It was blisteringly hot and the team met inside the Adventure Caffè. Skratch the Cat was on duty behind the bar and he welcomed everyone with a mighty meaow. "Ask the question Skratch!" cheered the Wabbit. "I will!" smiled Skratch; "What was that for a sort of freaky adventure?" Wabsworth gently pulled Tipsy into the bar, but she didn't need much pulling. "It belongs to the rather old genre of the road movie," said Wabsworth. "A special representational anchoring, necessarily rooted in recognition," nodded Skratch. "Speaking of anchors, the sun is well past the yardarm," said Tipsy. "I'll get the drinks," laughed Skratch. "The shark was this big!" yelled Lapinette suddenly. She threw her paws wide. So did everyone else. "It looked bigger," suggested the Wabbit. "What happened to the shark?" asked Wabsworth. "I hit it on the nose so hard its teeth rattled," grinned the Wabbit. Lapinette snorted. "It still has a chunk of his fur." Skratch scratched the corner of the bar. "The episodic nature of the adventure provided a staggered lurching, rather like an army truck." Wabsworth chuckled. "It was thematic foregrounding. The protagonists had no control of mysterious happenings." The Wabbit chortled. "The sequence was the adventure." Tipsy lurched forward and spoke directly to Skratch. "Any danger of you bringing me a little dwink?" "Tipsy! That's a trope," meaowed Skratch. "I can take a twope," shrugged Tipsy. 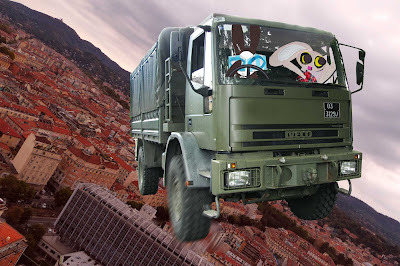 The Wabbit had tasked Tipsy to go over the truck with the finest tooth comb she could muster. 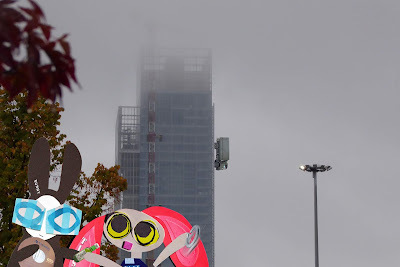 Mist shrouded the building and the Wabbit's fur felt damp. "Find anything?" Tipsy laughed and took the miniature whisky that the Wabbit quietly proffered. She tucked it into the top of her frock. "I found two things." She pushed a CD ROM into his paw. 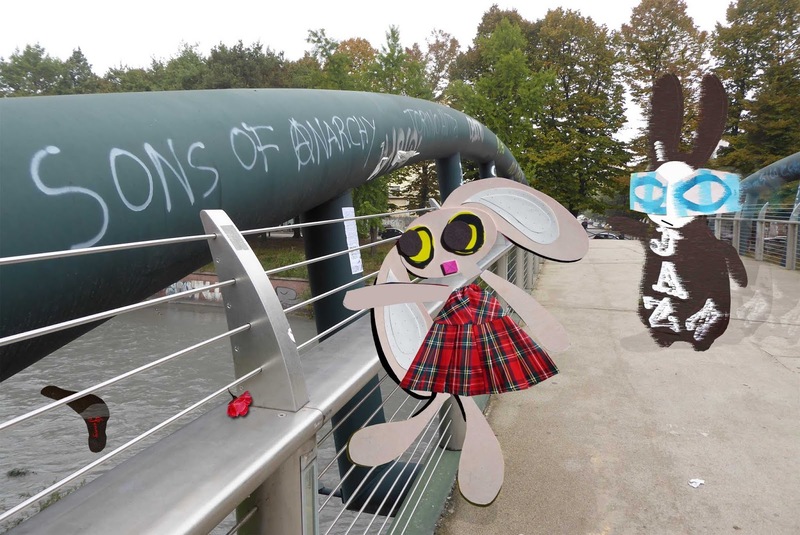 The Wabbit winced because he recognised it. It contained a series of modifications for Quantum the Train's lattice drive. "Don't worry Commander," said Tipsy, "it wasn't anything to do with your CD." She held out a shim. "This naughty washer is a weensy teensy bit out of phase." She spun the shim in the air and it hung for a while. Then it dropped into Tipsy's paw. "But not all the time," she added. "What's it out of phase with?" asked the Wabbit. He shoved the CD ROM deep into his fur with an exaggerated air of innocence. "Us," said Tipsy. 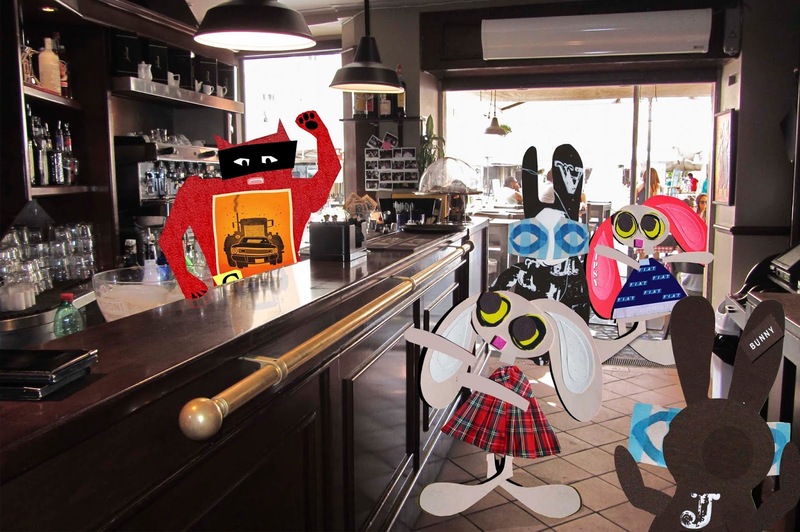 The Wabbit looked at the building and then at Tipsy. "Did you try putting it back?" "I made copies," smiled Tipsy, "and refitted every washer in the truck." Together they watched the truck moving up and down the building. "It's controllable," sighed the Wabbit with some relief. Tipsy raised her whisky miniature in the direction of the truck, then drained it in a single gulp. "For the most part..."
Lapinette drove through the dark and the dark seemed endless. But she saw a chink of light and she drove straight at it. There was crash and a lot of splintering as she hurtled through three corridors, down a flight of stairs and into a luxurious office. A panoramic window loomed. She pumped the throttle, shot through it and braked. The lorry stopped, half in, half out of a tall office block. The Wabbit looked down. "How many floors in this tower?" Lapinette grinned. "Thirty five counting the roof restaurant." "I know this building," said the Wabbit; "It's new. It's bioclimatic." "Not any more." giggled Lapinette. 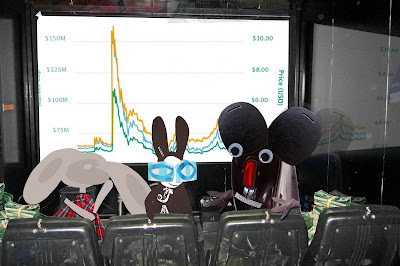 The Wabbit counted the floors. "How do we get down?" Lapinette made a calculation, then winked. She inched the truck forward until it pivoted on the rear axle. Then she gritted her teeth. "We drive down." The Wabbit braced. The truck lurched over until its front wheels touched the side of the building. Lapinette jabbed the throttle. The rear tyres bumped over the edge. She crashed the truck into reverse and stood on the brakes. The truck began to slide down. The Wabbit jerked the handbrake on. Lapinette gunned the throttle. Tyres groaned. Burning rubber fumes made them cough. Suddenly gravity grabbed the truck and it dropped with a slam. "Aaaagh!" yelled the Wabbit. But knobby tyres grabbed at the tower. The truck clung. Then with a squeal like a thousand bats - and a lot of smoke - it slid quietly to the bottom. "This wheel's on fire!" yelled Lapinette. The truck's descent took them over the sea. It was blue. Very blue indeed. And that was all there was. The truck settled on the surface. The engine died and everything became quiet, save for the sound of the waves and something they couldn't identify. "I'll look around," said the Wabbit. Lapinette didn't like the sea. It moved too much. But the Wabbit dived in with a merry shout. "Come on in, the water's fine!" It didn't look fine to Lapinette. The truck rose with the sea's swell and she felt like washing in a laundromat. 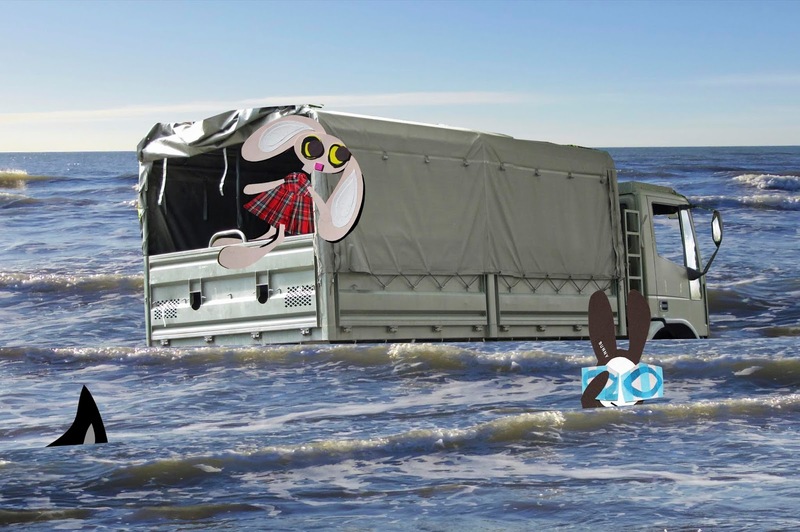 The Wabbit swam around the truck and back. He shook his head. "Nothing. No explanation." Lapinette smiled. "Maybe it's a magic truck." The Wabbit bobbed up and down. "It didn't used to be." "Did you check the tyres?" asked Lapinette. The Wabbit took in a mouthful of water and spluttered. "I hardly think pressure matters at the moment." Lapinette shook her head. "Maybe there's something inside the tyres." "I hadn't thought of that," said the Wabbit; "I'll dive down and have a look." But Lapinette saw something. "Not just yet. Come back." "I'll do it in a jiffy, won't be long," said the Wabbit. At that moment he turned to see a mouthful of serrated teeth headed straight at him. "Yikes!" he yelled. He swam fast for the truck and grabbed Lapinette's paw. "Are there killer sharks in the Med?" "Seven," said Lapinette. "Phew, not so many," said the Wabbit. "Seven species," sighed Lapinette. The truck would not behave. Even Lapinette was unable to prevent it shooting upwards until it was some height above the city. It was cold and the air was thin, but the truck's engine throbbed on with a consistent clatter. The Wabbit checked everything inside but there was no sign of modification. He hopped outside and Lapinette followed him. Together they clambered over and under the truck but nothing appeared out of the ordinary. The Wabbit peered down. He made a wry smile then shut his eyes. "What are you doing?" asked Lapinette. "Praying," replied the Wabbit. "Who to?" asked Lapinette. "Any gods I can think of," smiled the Wabbit. Lapinette was quiet for a moment but then she said, "Any reply?" "Nothing whatsoever," sighed the Wabbit. Lapinette shivered. "You'd think up here they'd be able to get through." 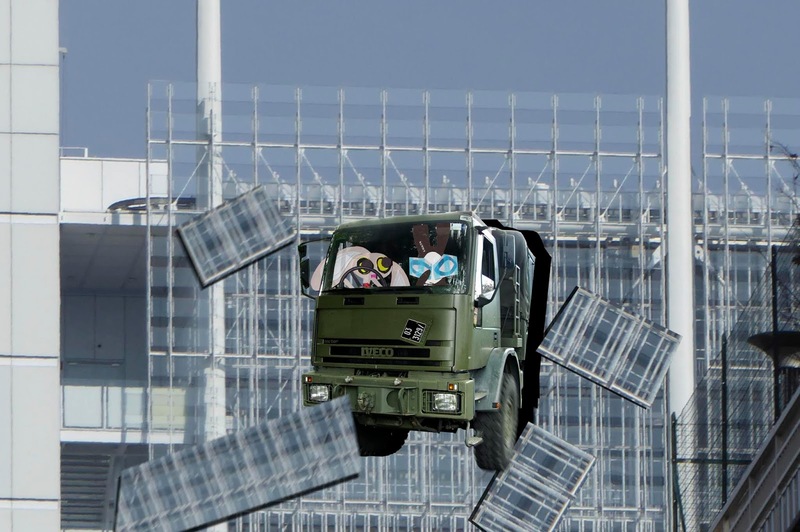 The truck engine hesitated and wheezed so they clambered back in the cab. With a cough and a splutter the engine stopped. The truck began to fall, slowly at first but quickly picking up speed. City streets rushed towards them. The Wabbit turned away from the window and shrugged. "Maybe a god did answer." The truck's descent slowed and the engine sprang to life. Lapinette laughed. "Deus ex machina?" Hardhack Rat and Lovely Lapinette met the Wabbit for a briefing in the secret DWA viewing theatre in Via Nizza. There, they looked at graphs and charts and analysed figures. "The market hardly recovered," said Lapinette. "Collateral damage," smiled the Wabbit. 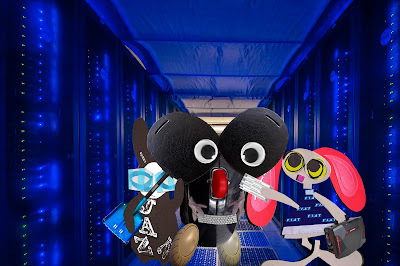 Hardhack was anxious to squeeze more life out the system and the Wabbit looked at him shrewdly. "Would you like to be in charge of my Dinosaur Fund?" Hardhack was delighted. "When do I start?" "Right now," yelled Lapinette. She waved at the chart. "We punished our enemies but innocent investors were caught in the operation." The Wabbit agreed that restitution should be made. Hardhack thought for a second. "I can hack back to the brokers." "That's a start," said Lapinette. "Afterwards, how much do we have left?" The Wabbit flicked imaginary lint from his fur. "€57 million - give or take fees or charges." "Which I am duty bound to minimise," said Hardback. "It's in our Articles of Association," explained the Wabbit. Lapinette raised both eyes. Her ears quivered. Suddenly she waved at the piles of notes. "Where's the rest of the money?" "At the Bank of Despond," said Hardhack. Lapinette gasped. "Our personal guards seized the building," shrugged the Wabbit. "Ours now," laughed Hardhack. Lapinette sighed. "The Department wants that building." "Sold to the Department!" shouted the Wabbit. Hardback's eyes gleamed as he made a note. " ... and leased back." "Nearly there!" said Hardhack. His ratty claws flew across the keyboard as he whistled 'Carolina Moon' This was getting on the Wabbit's nerves. "Is it working?" sighed the Wabbit. "Oh yes," said Hardhack; "This optimistic news will hike the price." He continued to type and whistle. Tipsy flourished a wad of crypto keys and giggled. "We're gonna pump and dump." 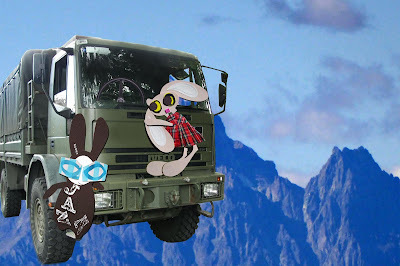 The Wabbit hopped patiently, clutching a shovel with he'd thought might be useful. He tried to keep up with the bitcoin market jargon, and waited. Hardhack entered all the key numbers. 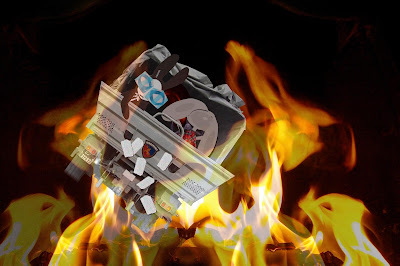 Tipsy opened a briefcase console and interfaced with the servers. Hardhack nodded to the Wabbit. "OK, Commander. Tipsy just sold you the keyholders' bitcoins. Then you sold them to me. Tipsy bought them back and now I have them." Tipsy checked her console monitor. "We have a spike." She bought the coins back. The spike climbed and went on climbing. "She's mooning!" yelled Tipsy. It peaked, dropped like a stone, then climbed rapidly again. "Now Hardhack! Fly me to the moon," shouted Tipsy. "Selling, selling, selling - all sold." said Hardhack. The spike peaked again, then fell rapidly. "The Market has been suspended," smiled Tipsy. "So who's left with the bag?" chuckled Hardhack. "I think I know," grinned the Wabbit.